Are you familiar with the blog, Kid World Citizen? If not, you should be! My friend Becky Morales is the beautiful mami behind it. Her site is centered around activities that help young minds go global. From geography to literature to world cultures, you'll find tons of tips and creative ideas for raising a world citizen. Recently, she teamed up with fellow blogger and author Homa Sabet Tavangar to publish The Global Education Toolkit for Elementary Learners (aff) a remarkable resource for teaching your child about the world. Inside you'll find hundreds of activities including a 12-month timeline, backmapping tips, 50+ ready-to-start projects, and online links. In addition to her site, Becky celebrates cultural diversity through engaging printables for parents and educators that are available from her TpT store. Becky has awesomely offered copies of her Bilingual Classroom Labels for two lucky MommyMaestra readers! - Lots of blank labels of different sizes! 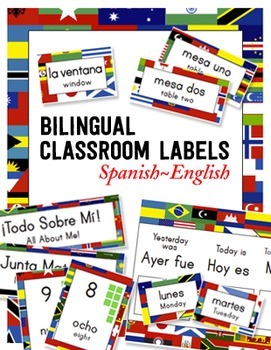 Classroom labeling is an important part of a language-rich learning environment. Print them on cardstock and laminate them for durability. To enter the giveaway, simply use the Rafflecopter below.